What happens after a gaming mouse manufacturer has pushed its design to the limit? A few other options can be explored, but a popular trend is to polish the existing designs. That’s the exact route Roccat has taken with its celebrated Kone mouse. The mouse has seen a lot of changes from the original XTD option to this particular version: the Kone EMP. A casual observation may create the impression that these mice are identical. That’s partly true because they are designed with the same shape. But beyond the surface, they are indeed not exactly the same. For instance, smoothening of the scroll wheel has been carried out without compromising on its rubber grip, actuation of the DPI buttons has been made easier, and the rarely used front button has been eliminated. Internally, changes are even more profound. Roccat, — just like its competitor Razer — has maintained a consistent design pattern for a long time. This means the company has discovered a unique design that serves its users well. 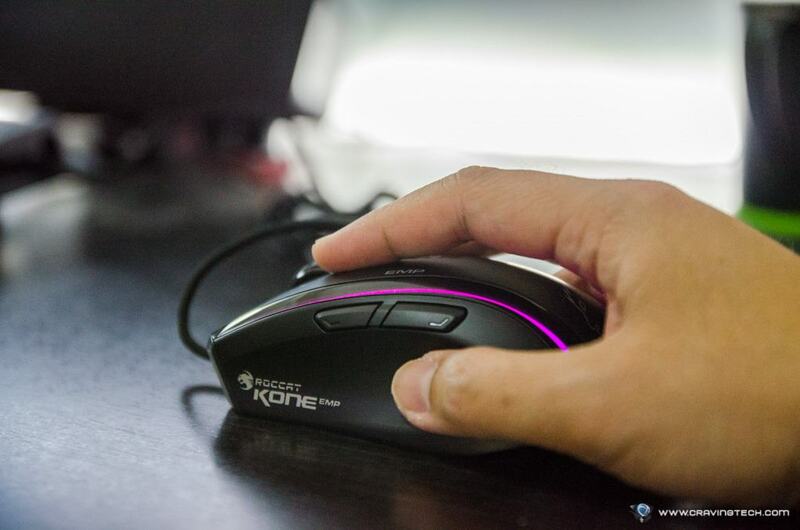 The Kone is arguably one of the best gaming mice, with its large though nonintrusive buttons positioned on the sides, outstanding finger and thumb resting on each side, and the included softly-flowing lines. A few of these features are also available on the Kone XTD and Kone Pure. Interestingly, Razer’s Mamba Tournament Edition picked a few ideas from the design, though it went a step further to provide multiple LEDs for every pipe, instead of a single LED on each end. The Kone EMP hasn’t changed much from its predecessors. It’s surprising that at a higher price, the mouse still features the very RGB effects present in its predecessor. It’s sad that with this model, the competition has overtaken the Kone EMP when it comes to RGB effects. While the mouse looks impressive in static images as well as static lighting mode — partly as a result of the natural dithering of the LED-projected light on both ends each lightpipe — the rainbow wave effect produced in the animation routine is not at par with what one gets with the other peripherals, such as the Corsair Polaris, Razer Firefly, and more. In motion, only four blinking lights are noticeably visible. Furthermore, the Swarm software is characterized by a few glitches, though Roccat is always quick to solve them with the regular Swarm software updates. Another feature missing in the Roccat Kone EMP is Roccat’s adjustable weight box available in the Kone XTD. On the brighter side, though, this was the perhaps the right move, partly since the current trend in mouse design focuses on reducing weight as much as possible. Although it might be as a result of the kinds of games people are currently playing, a better explanation could be that the modern high-refresh monitors might have exposed weaknesses previously inherent in past input devices, which were masked by the sloppy 60Hz monitors. When the mouse starts to become a liability rather than an asset, for instance when it slows down a 120 fps gaming session, the extra weight starts to become a concern. 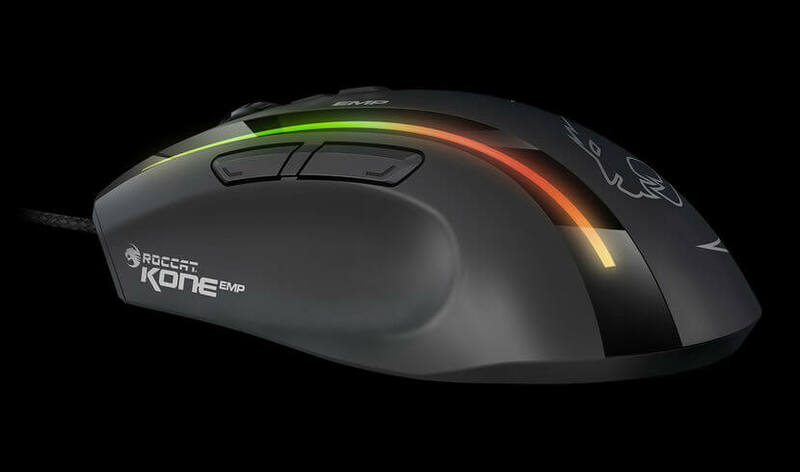 The Kone EMP weighs 118g, while its competitors, including the G502 and Razer Deathadder Chroma weigh 126g and 95g respectively. Nevertheless, the mouse’s weight might actually be an advantage considering that at 135mm by 75mm by 42mm, it has an above average size. Besides, it boasts of a larger volume compared to the Deathadder or G502. This makes it a good option for users with larger hands, though it might seem a bit bigger for other users. Most of the outlined features in this review are in fact identical or simple minor updates to the Kone XTD. One area, however, that Roccat has made some progress from the original is the sensor. The XTD was designed with the 8,2000DPI laser sensor. This was during the time when lasers were extremely popular. Nonetheless, lasers came with a few challenges, such as reduced accuracy, making manufacturers like Corsair, Roccat, and more to revert to optical sensors. The XTD later received an update introducing a 6,200DPI optical sensor. The Kone EMP incorporates the 12,000DPI optical sensor, which is also referred to as the “Owl-Eye”. It originates from the PixArt 3360 (also dubbed the 3361). The roccat kone aimo software comes with some pretty cool advantages. Make sure to read up on it.